July 6, 2015 October 8, 2015 / Steve M.
Collation: 104 pp. 1-10,,12,4. 17.6 x 11.0 cm., all edges trimmed. Printed on white wove paper. Contents: pp. [i-iv] blank. p.  THE | WHITE PAPER, reverse blank. p.  title, as above, reverse blank. pp. 5-9, Preface, signed by Jean Cocteau. p.  blank. pp. 11-46, text. p.  illustration. pp. 48-58, text. p.  illustration. pp. 60-68, text. p.  illustration. pp. 70-84, text. p.  illustration. pp. 86-88, text. p.  illustration. pp. 90-, text. p.  PRINTED | IN PARIS, | JULY 1957, | BY IMPRIMERIE MAZARINE, | FOR | THE OLYMPIA PRESS. | Dépôt légal : 3e trimestre 1957 | [rule] | Printed in France. pp. [96-100] blank. Binding: Olive-green wrappers, printed in black and trimmed flush with body of the book. 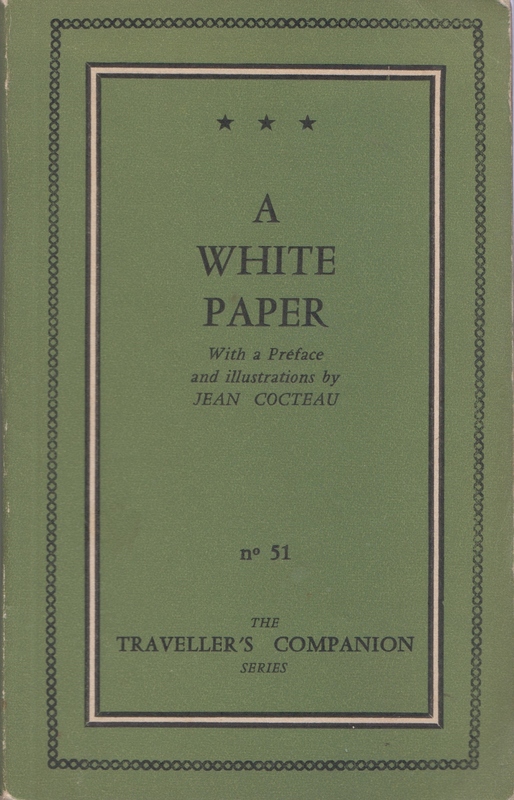 [Front cover; within a frame of two borders, the outer consisting of fine linked chain of type device in black, and the inner a thin band of white edged in black:] [three evenly spaced five-pointed black stars] | A [sic] | WHITE | PAPER | With a Preface | and illustrations by | JEAN COCTEAU | no 51 | THE | TRAVELLER’S COMPANION | SERIES. [Spine; within a white, black-edged panel, the series no. in horizontal digits at bottom and title lettered vertically up spine:] 51 [-] A [sic] WHITE PAPER. [Back cover, at bottom right-hand corner:] Francs : 1.200. Notes: (1) The translation is by Austryn Wainhouse, as revealed in a letter from Mr. Wainhouse to the compiler dated February 29th 1992. In addition to the five full-page illustrations indicated above in the collation, there are four in-text illustrations which appear on pp. 17, , 35, . (2) A copy in the collection of Mr William Ashley is in an altered state with a black sticker over the original price indicating a price increase to NF 18. Mr Steve Mullins of London, reports a copy in an altered state with the price overstamped NF18. (3) The original edition of Le Livre blanc was published at Paris in 1928 by Maurice Sachs and Jacques Bonjean, in an edition of just twenty-one copies. No author’s name was given. Two years later, an edition with seventeen illustrations credited to Cocteau was published, but the text remained anonymous. (4) Suppressed on May 14th, 1959 under the decree of May 1939 (article 14 of the law of July 29th 1881 sur la liberté de la presse), designed to combat politically and morally offensive périodiques et ouvrages de provenance étrangère. Collation: 288 pp. 52.1-52.188. 17.5 x 11.2 cm., all edges trimmed. Printed on white wove paper. Contents: pp. [1,2] blank. p.  .JULIETTE.. p.  .All rights relative to this English version | of \Juliette. are reserved by the Publishers. | Copyright c by The Olympia Press, 1962.. p.  title, as above, reverse blank. pp. 7- text. p.  blank. p.  .PRINTED IN FRANCE | by Imprimerie Moderne du Lion, Paris. July 1962. | [rule] | Depot legal : 3e trimestre 1962.. p.  blank. Binding: Olive-green wrappers, printed in black, and trimmed flush with body of the book. [Front cover; within a frame of two borders, the outer consisting of fine linked chain of type device in black, and the inner a thin band of white edged in black:] .D. A. F. DE SADE | THE STORY | OF | JULIETTE | VOLUME ONE | no 52 | THE | TRAVELLER’S COMPANION |SERIES.. [Spine; within a white, black-edged panel, the series no. in horizontal digits at bottom and title lettered vertically up spine:] .52 [-] THE STORY OF JULIETTE.. [Back cover, at bottom right-hand corner:] .18 N. F. | NOT TO BE SOLD | IN U.S.A. & U.K.. Notes: .Pierelessandro Casavini. is the pseudonym of Austryn Wainhouse. Collation: 272 pp. 53.1-52.178. 17.3 x 11.0 cm., all edges trimmed. Printed on white wove paper. Contents: pp. [1,2] blank. p.  JULIETTE. p.  PRINTED IN FRANCE | [rule] | Copyright by The Olympia Press, Paris, France 1959. p. title, as above, reverse blank. pp. 7- text. p.  PRINTED IN FRANCE | [rule] | Printed July 1959 by S.I.P., Montreuil, France | Dépôt légal : 3e trimestre 1959. pp. [270-272] blank. Binding: Olive-green wrappers, printed in black, and trimmed flush with body of the book. 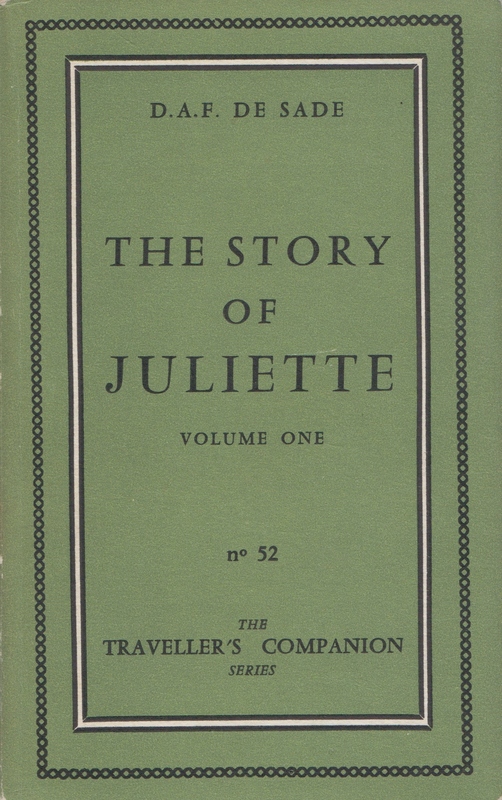 [Front cover; within a frame of two borders, the outer consisting of fine linked chain of type device in black, and the inner a thin band of white edged in black:] D. A. F. DE SADE | THE STORY | OF | JULIETTE | VOLUME TWO | no 53 | THE | TRAVELLER’S COMPANION |SERIES. [Spine; within a white, black-edged panel, the series no. in horizontal digits at bottom and title lettered vertically up spine:] 53 * * [-] THE STORY OF JULIETTE. [Back cover, at bottom right-hand corner:] Francs : 1.500. Notes: Pierelessandro Casavini is the pseudonym of Austryn Wainhouse. Two Copies one Very Good one Good Plus. Detailed description of condition and extra images on request. Collation: 184 pp. 1-108, 114, 128. 17.5 x 11.0 cm., all edges trimmed. Printed on white wove paper. Contents: pp. [1,2] blank. p.  JULIETTE. p.  [rule] |Copyright © by The Olympia Press, 1960, Paris, France. p.  title, as above, reverse blank. pp. 7-182 text. p.  PRINTED IN FRANCE | [rule] | Printed April 1960 by S.I.P., Montreuil, France | Dépôt légal : 2e trimestre 1960. p.  blank. Binding: Olive-green wrappers, printed in black, and trimmed flush with body of the book. 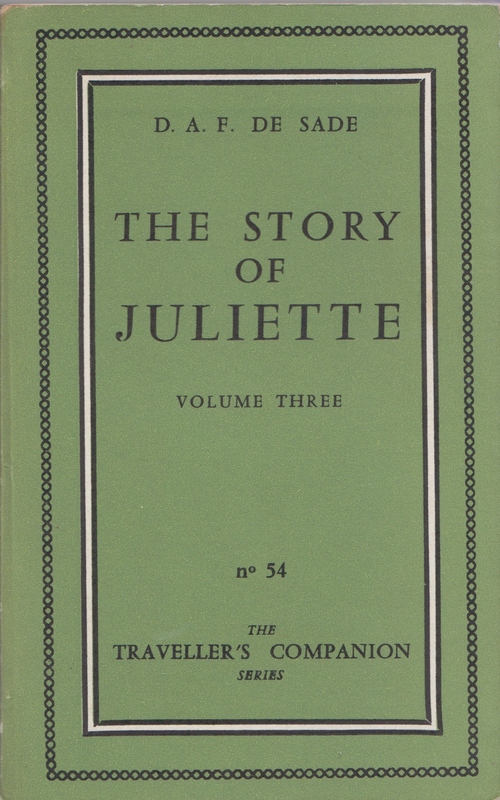 [Front cover; within a frame of two borders, the outer consisting of fine linked chain of type device in black, and the inner a thin band of white edged in black:] D. A. F. DE SADE | THE STORY | OF | JULIETTE | VOLUME THREE | no 54 | THE | TRAVELLER’S COMPANION | SERIES. [Spine; within a white, black-edged panel, the series no. in horizontal digits at bottom and title lettered vertically up spine:] 54 [-] THE STORY OF JULIETTE. [Back cover, at bottom right-hand corner:] 15 N. F. | Francs : 1.500 | NOT TO BE SOLD IN | THE U. S. A. OR U.K.. Notes: (1) Pierelessandro Casavini is the pseudonym of Austryn Wainhouse. (2) A later issue of this volume in Mr. William Ashley’s collection is identical in all respects to the one here described, save for the following differences: the border is in black rather than green. The price information on the backwrapper is given as: Francs : 15 | NOT TO BE SOLD IN | THE U.S.A. OR U.K.. It is perfect bound and some of the signatures of the original 1960 printing are redundantly preserved. Collation: 208 pp. Perfect bound and signatures irregular; those in brackets are inferred. [Juliette-*]4; Juliette-1 Juliette-416; [Juliette-516]; [Juliette-64]; Juliette-716. 17.5 x 11.0 cm., all edges trimmed. Printed on white wove paper. Contents: pp. [1,2] blank. p.  JULIETTE. p.  PRINTED IN FRANCE | [rule] | Copyright © by the Olympia Press, Paris, France, 1960.p. title, as above, reverse blank. pp. 7- text. p.  blank. p.  PRINTED IN FRANCE | by Imprimerie Georges Frère, Tourcoing (Nord), June 1960 | [rule] | Dépôt légal : 2e trimestre 1960. pp. [205-208] blank. Binding: Olive-green wrappers, printed in black, and trimmed flush with body of the book. 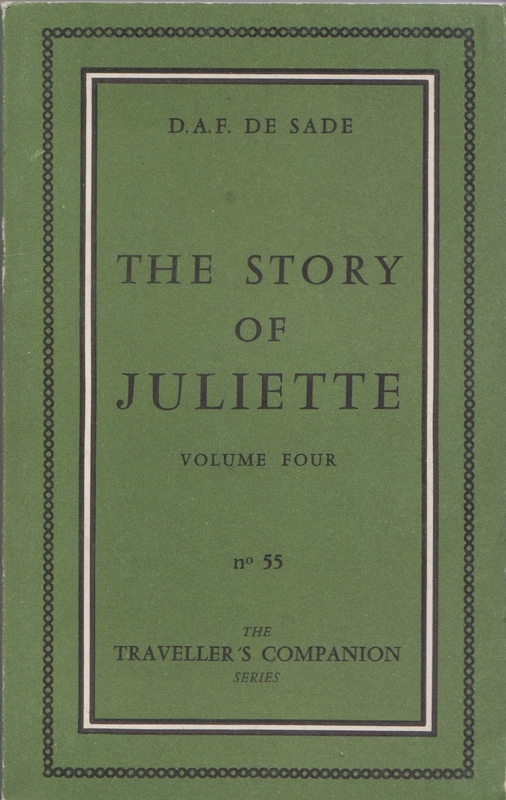 [Front cover; within a frame of two borders, the outer consisting of fine linked chain of type device in black, and the inner a thin band of white edged in black:] D. A. F. DE SADE | THE STORY | OF | JULIETTE | VOLUME FOUR | no 55 | THE | TRAVELLER’S COMPANION |SERIES. [Spine; within a white, black-edged panel, the series no. in horizontal digits at bottom and title lettered vertically up spine:] 55 [-] THE STORY OF JULIETTE. [Back cover, at bottom right-hand corner:] NF : 15 | NOT TO BE SOLD | IN U. S. A. OR U.K.. Notes: (1) Pierelessandro Casavini is the pseudonym of Austryn Wainhouse. (2) An altered state in known with a price increase stamped over the existing price. The stamp, which is dark blue, comprises a box containing NEW PRICE | NF 18. Below the box are two lines intended to overprint the old price. 4 copies 2 very good 2 Good. Extra Images and full description of condition on request. Collation: 212 pp. Perfect bound; no signatures. 17.5 x 10.9 cm., all edges trimmed. Printed on white wove paper. Contents: pp. [1,2] blank. p.  JULIETTE. p.  PRINTED IN FRANCE | by Imp. G. FRÈRE, Tourcoing, April 1961. | [rule] | Copyright © by The Olympia Press, Paris, France, 1961 | Dépôt légal : 2eme trimestre 1961. p.  title, as above, reverse blank. pp. 7- text. Binding: Olive-green wrappers, printed in black, and trimmed flush with body of the book. [Front cover; within a frame of two borders, the outer consisting of fine linked chain of type device in black, and the inner a thin band of white edged in black:] D. A. F. DE SADE | THE STORY | OF | JULIETTE | VOLUME FIVE | no 56 | THE | TRAVELLERřS COMPANION |SERIES. [Spine; within a white, black-edged panel, the series no. in horizontal digits at bottom and title lettered vertically up spine:] 56 [-] THE STORY OF JULIETTE. [Back cover, at bottom right-hand corner:] NF : 15 | NOT TO BE SOLD | IN U. S. A. AND U.K.. Notes: Pierelessandro Casavini is the pseudonym of Austryn Wainhouse. Two Copies about GOOD. Full description of condition and extra images on request. Collation: 204 pp. -128; 136. 17.4 x 10.8 cm., all edges trimmed. Printed on white wove paper. Contents: pp. [1,2] blank. p.  JULIETTE. p.  PRINTED IN FRANCE | [rule] | Copyright © by The Olympia Press, Paris, France, 1964. p.  title, as above, reverse blank. pp. 7-201 text. pp. [202-204] blank. Binding: Olive-green wrappers, printed in black, and trimmed flush with body of the book. 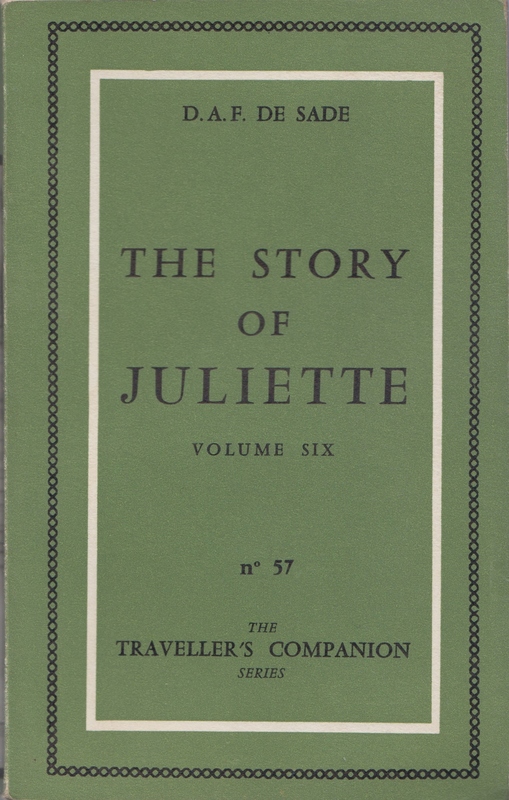 [Front cover; within a frame of two borders, the outer consisting of fine linked chain of type device in black, and the inner a thin band of white:] D. A. F. DE SADE | THE STORY | OF | JULIETTE | VOLUME SIX | no 57 |THE | TRAVELLER’S COMPANION | SERIES. [Spine; within a white, black-edged panel, the series no. in horizontal digits at bottom and title lettered vertically up spine:] 57 [-] THE STORY OF JULIETTE. [Back cover, at bottom right-hand corner:] 18 F | NOT TO BE SOLD | IN U. S. A. & U.K..
Notes: (1) No printing details furnished in the book. (2) Pierelessandro Casavini is the pseudonym of Austryn Wainhouse; John Crombie is not a pseudonym. 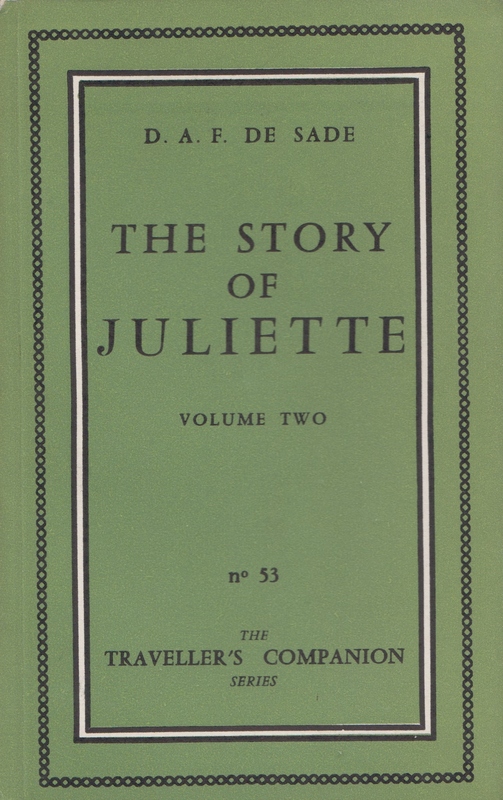 (3) In a letter to the present writer dated January 11th 1976, Mr. Wainhouse stated that he was involved in translating only the first five volumes of Juliette. 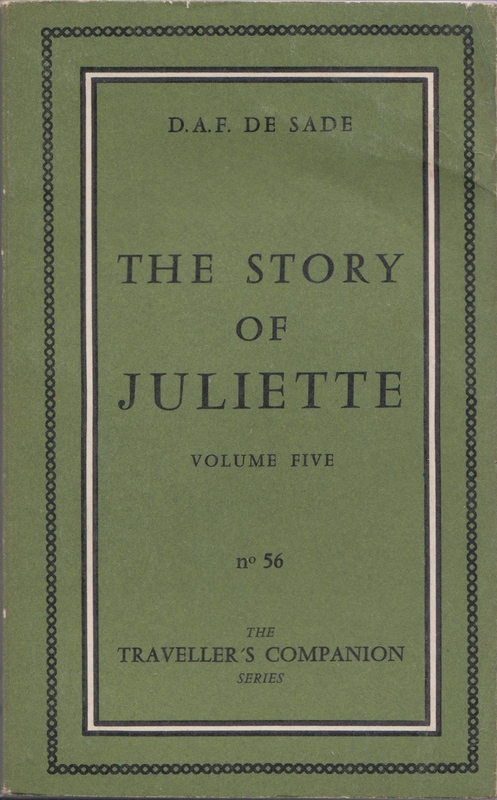 This was later corroborated in a letter dated March 17th 1986 from John Crombie who acknowledged that contrary to what the title page has to say he was the sole translator of volume six of Juliette; Mr Wainhouse’s labours on this ambitious project concluded with volume five, and it was initially thought that the balance of the book could be contained within a single volume which Mr Crombie was commissioned to translate. However, it became apparent that two further volumes would be required to complete the enterprise, and for contractual reasons now forgotten by Mr Crombie the name of Pieralessandro Casavini was retained on the first of these. The reprint of the Olympia Press translation of Juliette published at New York by Grove Press seems to have abandoned Mr Crombie’s volumes in favour of a totally new translation by Wainhouse. 1 Copy Very Good + , Extra images and details of condition on request. Collation: 192 pp. 59.1 – 59.128. 17.6 x 11.1 cm., all edges trimmed. Printed on white wove paper. Contents: pp. [1,2] blank. p.  DISSOLVING. p.  [rule] | All right reserved by The Olympia Press Paris France. p.  title, as above, reverse blank. pp. 7- text. p.  blank. p.  PRINTED IN FRANCE | [rule] | Printed March 1958 by S.I.P., Montreuil, France | Dépôt légal : 1er trimestre 1958. pp. [190-192] blank.Binding: Olive-green wrappers, printed in black, and trimmed flush with body of the book. 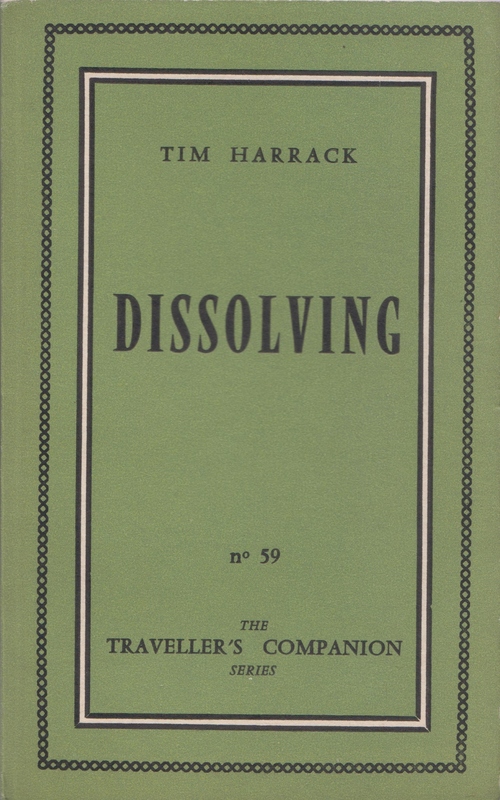 [Front cover; within a frame of two borders, the outer consisting of fine linked chain of type device in black, and the inner a thin band of white edged in black:] TIM HARRACK | DISSOLVING | no 59 | THE | TRAVELLER’S COMPANION | SERIES. [Spine; within a white, black-edged panel, the series no. in horizontal digits at bottom and title lettered vertically up spine:] 59 [-] DISSOLVING. [Back cover, at bottom right-hand corner:] Francs : 1.200. Notes: Suppressed on May 14th, 1959 under the decree of May 1939 (article 14 of the law of July 29th 1881 sur la liberté de la presse), designed to combat politically and morally offensive périodiques et ouvrages de provenance étrangère. 2 Copies one Near Fine one Very Good Plus. Detailed description of condition and extra images on request. Collation: 224 pp. No signatures, but [1-14]8. 17.3 x 11.3 cm., all edges trimmed. Printed on white wove paper. Contents: pp. [1,2] blank. p.  I | HEAR | VOICES, reverse blank. p.  title, as above. p.  PRINTED IN FRANCE | [rule] | All rights reserved by The Olympia Press, Paris | COPYRIGHT 1958. p.  Until, gentlemen, you decide | further what my occupation is, you | may as well announce me as com- | forting 35 whirlpools below sound. | A Schizophrenic. p.  blank. pp. 9- text. p.  blank. p.  PRINTED IN FRANCE | [rule] | Printed December 1957 by S.I.P., Montreuil, France | Dépôt légal : 4e trimestre 1957 pp. [222-224] blank. Binding: bound in green cloth boards, with red endpapers and with black paper labels on spine and front cover, printed in gold and white. Label on front cover measures 5.2 x 8.2 cm. 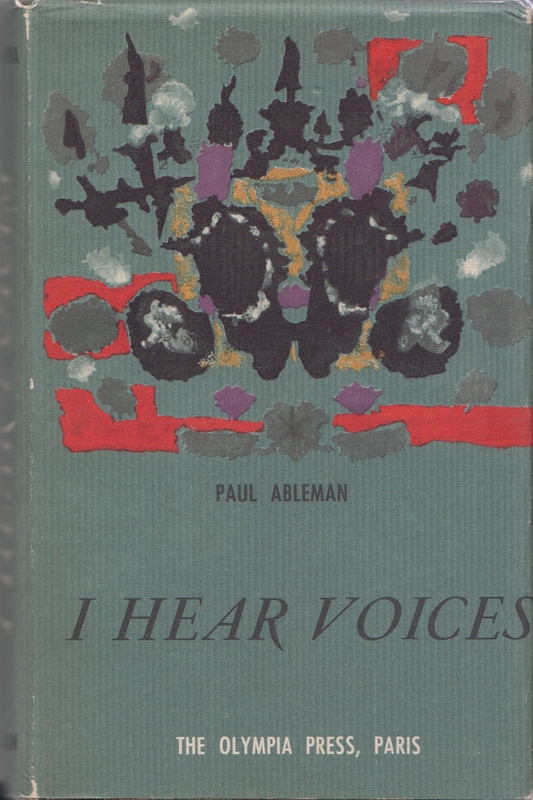 and has a gold border decorated in black with the same type ornament used on the titlepage: [in gold] PAUL ABLEMAN | [in white] I HEAR VOICES | [in gold] THE OLYMPIA PRESS, PARIS. Label on spine measures 5.0 x 2.4 cm. and is similarly decorated, but at top and bottom only: [in gold] ABLEMAN | [in white] I | HEAR | VOICES | [in gold] OLYMPIA. Published in a matt, grey-blue dustjacket with an abstract design on the front in red, black, yellow, white and orange. The author’s name, title of the book and publisher on spine and front of wrapper in black and white. The inside flaps of the dustjacket contain an anonymous review of synopsis of the novel, together with advertisments for Molloy and Watt, two books by Samuel Beckett also published by the Olympia Press. At the bottom of the back inside flap of the dustjacket is printed the information that book was distributed in the United Kingdom by Zwemmer, a well-known art bookshop in London’s Charing Cross Road. Notes: As yet unkown in the conventional green-wrappered Traveller’s Companion format; indeed, its number within the series is not to be found in the book, but is taken from Olympia advertisments where it is listed as number 60 of the series. No price appears on any copies that have been examined, but Olympia Press catalogues list it variously at 15 and 18 NF.